WELCOME TO THE ONE-PARTY STATE | "Global Possibilities"
Republicans control the House, Senate, and presidency. It’s time we start calling this what it is. Know thyself. It was what came to mind in the wake of Donald Trump’s victory and my own puzzling reaction to it. And while that familiar phrase just popped into my head, I had no idea it was so ancient, or Greek, or for that matter a Delphic maxim inscribed in the forecourt of the Temple of Apollo according to the Greek writer Pausanias (whom I’d never heard of until I read his name in Wikipedia). Think of that as my own triple helix of ignorance extending back to… well, my birth in a very different America 72 years ago. Consider this my little introduction to a mystery I stumbled upon in the early morning hours of our recent election night that hasn’t left my mind since. I simply couldn’t accept that Donald Trump had won. Not him. Not in this country. Not possible. Not in a million years. In the wake of the election, however, it wasn’t shock based on pollsters’ errors that got to me. It was something else that only slowly dawned on me. Somewhere deep inside, I simply didn’t believe that, of all countries on this planet, the United States could elect a narcissistic, celeb billionaire who was also, in the style of Italy’s Silvio Berlusconi, a right-wing “populist” and incipient autocrat. Plenty of irony lurked in that conviction, which outlasted the election and so reality itself. In these years, I’ve written critically of the way just about every American politician but Donald Trump has felt obligated to insist that this is an “exceptional” or “indispensable” nation, “the greatest country” on the planet, not to speak of in history. (And throw in as well the claim of recent presidents and so many others that the US military represents the “greatest fighting force” in that history.) President Obama, Marco Rubio, Jeb Bush, John McCain—it didn’t matter. Every one of them was a dutiful or enthusiastic American exceptionalist. As for Trump’s opponent, Hillary Clinton, she hit the trifecta plus one in a speech she gave to the American Legion’s national convention during the campaign. In it, she referred to the United States as “the greatest country on Earth,” “an exceptional nation,” and “the indispensable nation” that, of course, possessed “the greatest military” ever. (“My friends, we are so lucky to be Americans. It is an extraordinary blessing.”) Only Trump, with his “make America great again,” slogan seemed to admit to something else, something like American decline. Post-election, here was the shock for me: it turned out that I, too, was an American exceptionalist. I deeply believed that our country was simply too special for The Donald, and so his victory sent me on an unexpected journey back into the world of my childhood and youth, back into the 1950s and early 1960s when (despite the Soviet Union) the United States really did stand alone on the planet in so many ways. Of course, in those years, no one had to say such things. All those greatests, exceptionals, and indispensables were then dispensable and the recent political tic of insisting on them so publicly undoubtedly reflects a defensiveness that’s a sign of something slipping. Obviously, in those bedrock years of American power and strength and wealth and drive and dynamism (and McCarthyism, and segregation, and racism, and smog, and…), the very years that Donald Trump now yearns to bring back, I took in that feeling of American specialness in ways too deep to grasp. Which was why, decades later, when I least expected it, I couldn’t shake the feeling that it couldn’t happen here. In actuality, the rise to power of Trumpian figures—Rodrigo Duterte in the Philippines, Viktor Orban in Hungary, Recep Tayyip Erdogan in Turkey, Vladimir Putin in Russia—has been a dime-a-dozen event elsewhere and now looks to be a global trend. It’s just that I associated such rises with unexceptional, largely tinpot countries or ones truly down on their luck. So it’s taken me a few hard weeks to come to grips with my own exceptionalist soul and face just how Donald Trump could—indeed did—happen here. So how did it happen here? * The Coming of a 1 Percent Economy and the 1 Percent Politics That Goes With It: A singular reality of this century has been the way inequality became embedded in American life, and how so much money was swept ever upwards into the coffers of 1 percent profiteers. Meanwhile, a yawning gap grew between the basic salaries of CEOs and those of ordinary workers. In these years, as I’m hardly the first to point out, the country entered a new Gilded Age. In other words, it was already a Mar-a-Lago moment before The Donald threw his hair into the ring. Without the arrival of casino capitalism on a massive scale (at which The Donald himself proved something of a bust), Trumpism would have been inconceivable. And if, in its Citizens United decision of 2010, the Supreme Court hadn’t thrown open the political doors quite so welcomingly to that 1 percent crew, how likely was it that a billionaire celebrity would have run for president or become a favorite among the white working class? 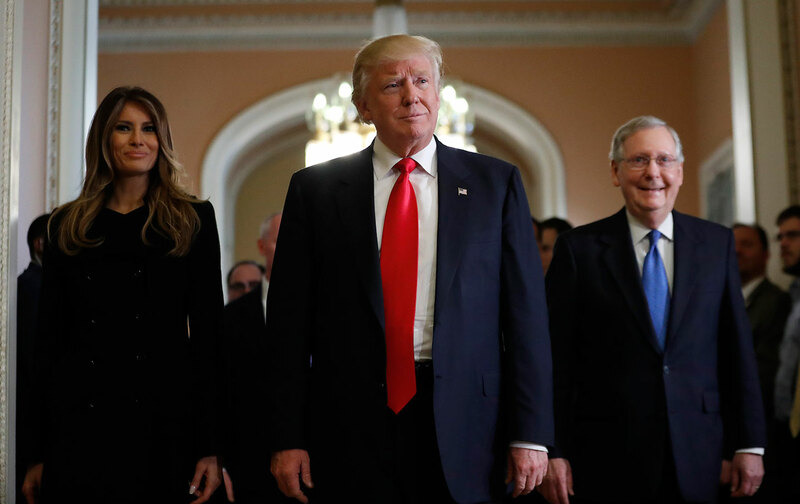 Looked at a certain way, Donald Trump deserves credit for stamping the true face of 21st-century American plutocracy on Washington by selecting mainly billionaires and multimillionaires to head the various departments and agencies of his future government. After all, doesn’t it seem reasonable that a 1 percent economy, a 1 percent society, and a 1 percent politics should produce a 1 percent government? Think of what Trump has so visibly done as American democracy’s version of truth in advertising. And of course, if billionaires hadn’t multiplied like rabbits in this era, he wouldn’t have had the necessary pool of plutocrats to choose from. Something similar might be said of his choice of so many retired generals and other figures with significant military backgrounds (ranging from West Point graduates to a former Navy SEAL) for key “civilian” positions in his government. Think of that, too, as a truth-in-advertising moment leading directly to the second shift in American society. * The Coming of Permanent War and an Ever More Militarized State and Society: Can there be any question that, in the 15-plus years since 9/11, what was originally called the “Global War on Terror” has become a permanent war across the Greater Middle East and Africa (with collateral damage from Europe to the Philippines)? In those years, staggering sums of money—beyond what any other country or even collection of countries could imagine spending—has poured into the US military and the arms industry that undergirds it and monopolizes the global trade in weaponry. In the process, Washington became a war capital and the president, as Michelle Obama indicated recently when talking about Trump’s victory with Oprah Winfrey, became, above all, the commander in chief. (“It is important for the health of this nation,” she told Winfrey, “that we support the commander in chief.”) The president’s role in wartime had, of course, always been as commander in chief, but now that’s the position many of us vote for (and even newspapers endorse), and since war is so permanently embedded in the American way of life, Donald Trump is guaranteed to remain that for his full term. And the role has expanded strikingly in these years, as the White House gained the power to make war in just about any fashion it chose without significant reference to Congress. The president now has his own air force of drone assassins to dispatch more or less anywhere on the planet to take out more or less anyone. At the same time, cocooned inside the US military, an elite, secretive second military, the Special Operations forces, has been expanding its personnel, budget, and operations endlessly and its most secretive element, the Joint Special Operations Command, might even be thought of as the president’s private army. Meanwhile, the weaponry and advanced technology with which this country has been fighting its never-ending (and remarkably unsuccessful) conflicts abroad—from Predator drones to the Stingray that mimics a cell phone tower and so gets nearby phones to connect to it—began migrating home, as America’s borders and police forces were militarized. The police have been supplied with weaponry and other equipment directly off the battlefields of Iraq and Afghanistan, while veterans from those wars have joined the growing set of SWAT teams, the domestic version of special-ops teams, that are now a must-have for police departments nationwide. It’s no coincidence that Trump and his generals are eager to pump up a supposedly “depleted” US military with yet more funds or, given the history of these years, that he appointed so many retired generals from our losing wars to key “civilian” positions atop that military and the national security state. As with his billionaires, in a decisive fashion, Trump is stamping the real face of twenty-first-century America on Washington. * The Rise of the National Security State: In these years, a similar process has been underway in relation to the national security state. Vast sums of money have flowed into the country’s 17 intelligence outfits (and their secret black budgets), into the Department of Homeland Security, and the like. (Before 9/11, Americans might have associated that word “homeland” with Nazi Germany or the Soviet Union, but never with this country.) In these years, new agencies were launched and elaborate headquarters and other complexes built for parts of that state within a state to the tune of billions of dollars. At the same time, it was “privatized,” its doors thrown open to the contract employees of a parade of warrior corporations. And, of course, the National Security Agency created a global surveillance apparatus so all-encompassing that it left the fantasies of the totalitarian regimes of the twentieth century in the dust. As the national security state rose in Washington amid an enveloping shroud of secrecy (and the fierce hounding or prosecution of any whistleblower), it became the de facto fourth branch of government. Under the circumstances, don’t think of it as a happenstance that the 2016 election might have been settled 11 days early thanks to FBI Director James Comey’s intervention in the race, which represented a historical first for the national security state. Argue as you will over how crucial Comey’s interference was to the final vote tallies, it certainly caught the mood of the new era that had been birthed in Washington long before Donald Trump’s victory. Nor should you consider it a happenstance that possibly the closest military figure to the new commander in chief is his national security adviser, retired Lieutenant General Michael Flynn, who ran the Defense Intelligence Agency until forced out by the Obama administration. No matter the arguments Trump may have with the CIA or other agencies, they will be crucial to his rule (once brought to heel by his appointees). Those billionaires, generals, and national security chieftains had already been deeply embedded in our American world before Trump made his run. They will now be part and parcel of his world going forward. The fourth shift in the landscape is ongoing, not yet fully institutionalized, and harder to pin down. * The Coming of the One-Party State: Thanks to the political developments of these years, and a man with obvious autocratic tendencies entering the Oval Office, it’s possible to begin to imagine an American version of a one-party state emerging from the shell of our former democratic system. After all, the Republicans already control the House of Representatives (in more or less perpetuity, thanks to gerrymandering), the Senate, the White House, and assumedly in the years to come the Supreme Court. They also control a record 33 out of 50 governorships, have tied a record by taking 68 out of the 98 state legislative chambers, and have broken another by gaining control of 33 out of 50 full legislatures. In addition, as the North Carolina legislature has recently shown, the urge among state Republicans to give themselves new, extra-democratic, extra-legal powers (as well as a longer-term Republican drive to restrict the ballot in various ways, claiming nonexistent voter fraud) should be considered a sign of the direction in which we could be headed in a future embattled Trumpist country. In addition, for years the Democratic Party saw its various traditional bases of support weaken, wither, or, in the recent election, simply opt for a candidate competing for the party’s nomination who wasn’t even a Democrat. Until the recent election loss, however, it was at least a large, functioning political bureaucracy. Today, no one knows quite what it is. It’s clear, however, that one of America’s two dominant political parties is in a state of disarray and remarkable weakness. Meanwhile, the other, the Republican Party, assumedly the future base for that Trumpian one-party state, is in its own disheveled condition, a party of apparatchiks and ideologues in Washington and embattled factions in the provinces. In many ways, the incipient collapse of the two-party system in a flood of 1 percent money cleared the path for Trump’s victory. Unlike the previous three shifts in American life, however, this one is hardly in place yet. Instead, the sense of party chaos and weakness so crucial to the rise of Donald Trump still holds, and the same sense of chaos might be said to apply to the fifth shift I want to mention. * The Coming of the New Media Moment: Among the things that prepared the way for Trump, who could leave out the crumbling of the classic newspaper/TV world of news? In these years, it lost much of its traditional advertising base, was bypassed by social media, and the TV part of it found itself in an endless hunt for eyeballs to glue, normally via 24/7 “news” events, eternally blown out of proportion but easy to cover in a nonstop way by shrinking news staffs. As an alternative, there was the search for anything or anyone (preferably of the celebrity variety) that the public couldn’t help staring at, including a celebrity-turned-politician-turned-provocateur with the world’s canniest sense of what the media so desperately needed: him. It may have seemed that Trump inaugurated our new media moment by becoming the first meister-elect of tweet and the shout-out master of that universe, but in reality he merely grasped the nature of our new, chaotic media moment and ran with it. Let’s add a final point to the other five: Donald Trump will inherit a country that has been hollowed out by the new realities that made him a success and allowed him to sweep to what, to many experts, looked like an improbable victory. He will inherit a country that is ever less special, a nation that, as Trump himself has pointed out, has an increasingly third-worldish transportation system (not a single mile of high-speed rail and airports that have seen better days), an infrastructure that has been drastically debased, and an everyday economy that offers lesser jobs to ever more of his countrymen. It will be an America whose destructive power only grows but whose ability to translate that into anything approaching victory eternally recedes. With its unexceptional billionaires, its dispensable generals, its less-than-great national-security officials, its dreary politicians, and its media moguls in search of the passing buck, it’s likely to be a combustible country in ways that will seem increasingly familiar to so many elsewhere on this planet, and increasingly strange to the young Tom Engelhardt who still lives inside me. It’s this America that will tumble into the debatably small but none-too-gentle hands of Donald Trump on January 20. Tom Engelhardt Tom Engelhardt created and runs Tomdispatch.com, a project of The Nation Institute where he is a Fellow.